Growing evidence, such as the correlations between paleoclimate records and solar and cosmic ray activity indicators (e.g., 10Be, 14C), suggests that extraterrestrial phenomena are responsible for at least some climatic variability on time scales ranging from days to millennia (Friis-Christensen and Lassen, 1991; Tinsley and Deen, 1991; Soon et al., 1996; Svensmark, 1998; Beer et al., 2000; Egorova et al., 2000; Soon et al., 2000; BjÃ¶rck et al., 2001; Bond et al., 2001; Hodell et al., 2001; Kromer et al., 2001; Labitzke and Weber, 2001; Neff et al., 2001; Todd and Kniveton, 2001; Pang and Yau, 2002; Solanki, 2002). These correlations mostly surpass those, if any, for the coeval climate and CO2. Empirical observations indicate that the climate link could be via solar wind modulation of the galactic cosmic ray flux (CRF) (Tinsley and Deen, 1991; Svensmark, 1998; Marsh and Svensmark, 2000; Todd and Kniveton, 2001; Shaviv, 2002a, 2002b) because an increase in solar activity results not only in enhanced thermal energy flux, but also in more intense solar wind that attenuates the CRF reaching Earth. The CRF, in turn, correlates convincingly with the low-altitude cloud cover on time scales from days (Forbush phenomenon) to decades (sun spot cycle). The postulated causation sequence is therefore: brighter sun -> enhanced thermal flux + solar wind ->muted CRF .> less low-level clouds -> less albedo -> warmer climate. Diminished solar activity results in an opposite effect. The apparent departure from this pattern in the 1990s (Solanki, 2002) may prove to be a satellite calibration problem (Marsh and Svensmark, 2003). The CRF “cloud-cover” climate link is also physically feasible because the CRF governs the atmospheric ionization rate (Ney, 1959; Svensmark, 1998), and because recent theoretical and experimental studies (Dickenson, 1975; Harrison and Aplin, 2001; Eichkorn et al., 2002; Yu, 2002; Tinsley and Yu, 2003) relate the CRF to the formation of charged aerosols, which could serve as cloud condensation nuclei (CCN), as demonstrated independently by ground-based and airborne experiments (Harrison and Aplin, 2001; Eichkorn et al., 2002). Finally, despite the copious referencing for other links in his argument, he gives no evidence that global cloudiness is in fact decreased during sunspot maxima and Forbrush events. Of course, I was not thinking to GCR when I posted my comment. More simply, I refer to millenial-scale and geological-scale solar forcing (radiative and orbital) – whose GCR-cloud effect could be a retroaction (but no proof of that for the moment, I agree). I don’t know if and how we can exclude this forcing for Pleistocene T variations you described as mainly CO2-induced. It seems to show that complex life can survive several thousand ppm CO2. That should counter claims that 600ppm is likely to make humans extinct. And based on PETM and similar events which ongoing around 100.000 years there is enough time for humans to becoem extinct. If not – than this survivors will not have a life we life today it will be underground – no sun and not much living on the earth. The PETM took a few 1000 years till it ‘arrived’ – the diffrent this time is we putting more greenhouse gasses into the air (exalerating) and faster. Also a diffrent chemistry of the air will manipulate species evolution (Oxygen levels). This has been allready documented on small genoms (fruit flys for a fact, which got a fast birth rate). Identification of the causes of past climate change requires detailed knowledge of one of the most important natural factorsâ��solar forcing. Prior to the period of direct solar observations, radionuclide abundances in natural archives provide the best-known proxies for changes in solar activity. Here we present two independent reconstructions of changes in solar activity during the last 1000 yr, which are inferred from 10Be and 14C records. We analyse the tree-ring 14C data (SHCal, IntCal04 from 1000 to 1510 AD and annual data from 1511 to 1950 AD) and four 10Be records from Greenland ice cores (Camp Century, GRIP, Milcent and Dye3) together with two 10Be records from Antarctic ice cores (Dome Concordia and South Pole). In general, the 10Be and 14C records exhibit good agreement that allows us to obtain reliable estimates of past solar magnetic modulation of the radionuclide production rates. 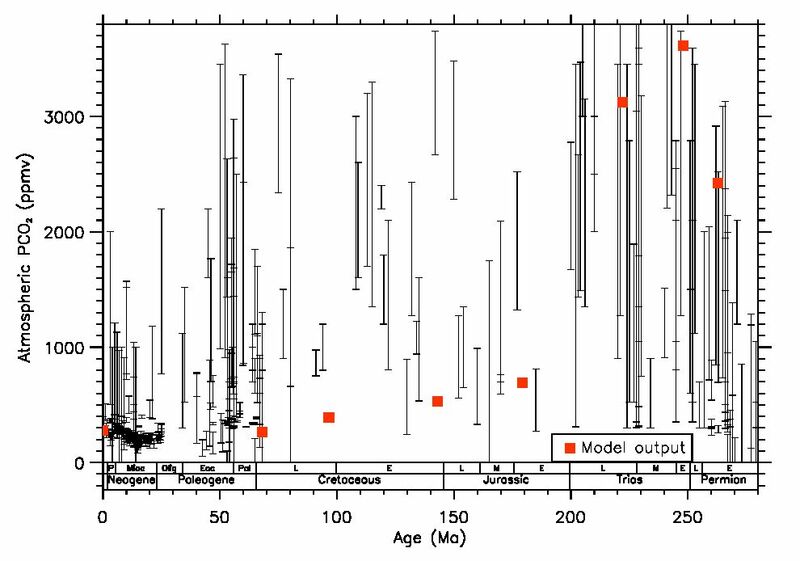 Differences between 10Be records from Antarctica and Greenland indicate that climatic changes have influenced the deposition of 10Be during some periods of the last 1000 yr. The radionuclide-based reconstructions of past changes in solar activity do not always agree with the sunspot record, which indicates that the coupling between those proxies is not as close as has been sometimes assumed. The tree-ring 14C record and 10Be from Antarctica indicate that recent solar activity is high but not exceptional with respect to the last 1000 yr.
Raypierre, so can I! But I am still a little unclear on your hypothesis. Are you saying that other radiative forcings besides CO2 have not been significant contributors to climate change throughout the Phanerozoic? Are you also saying that aerosols are not significant to the present climate? I think you do not intend to answer in the affirmitive to either of these questions. As far as ascribing significance to aerosols in the geologic past, I was simply envoking uniformitarianism. The physics operates today, so it must have operated in the past. Do you disagree with the physics or uniformitarianism? I think neither. Since we both agree that Stephan-Boltzmann is a physical law, will you not enlighten the readers by telling us more about the reasons you are not *completely* certain? Are you really that agnostic about the physics? But I never said either. You were being broadly misleading. Please do not try and win the argument by hooking stupid ideas to me. You seemed rather angry. Raypierre, I think we probably agree on more than you think, but a reader from the general public might understandably be confused. [Response: I’ll repeat my challenge in another way: The work of Berner and others has shown how to explain certain major features of the Phanerozoic climate, assuming that sensitivity to radiative forcing is similar to that in standard climate models. The direction of the remaining mismatch, if anything, points toward climate being more susceptible to major changes than standard models predict. This class of theories doesn’t by any means explain all features of Phanerozoic climate, but can you come even THAT close with any quantified model that has low sensitivity to CO2? Remember that if you are invoking any hypothetical stabilizing feedback mechanism (e.g. Lindzen’s Iris) for consistency you have to apply that stabilization to all radiative forcings on an even footing. That comment applies to volcanic aerosol forcing, as well as hypothetical cloud forcing from GCR (if the proponents of that theory ever manage to get halfway reliable quantifications of the forcing). RE: #56 – Also, he downsized your “soot and volcanic ash” into “soot.” Of course there was volcanic ash across the Phanerozoic. The number of possible forcings over geologic time is indeed bewildering. I have long been hoping for attention to be paid to this issue, just for curiosity’s sake. I am glad to see a compilation of CO2 concentrations since the Permian. I was wondering about various CO2 regulating effects. For instance, the Hercynian mega-cycle would potentially yield a CO2 drawdown similar to that proposed for mechanical weathering related to Tertiary mountain building (how sure is the Tertiary drawdown attributed to this cause btw.?). Similarly, the later Cimmerian mega-cycle. On exotic forcings, how much effect do 1st/2nd order eustatic sea level changes have? Presumably significant changes in the percentage of Earth’s surface covered by water must have an influence, and when these are due to variable spreading ridge production and ocean basin volumes, then presumably this effect is largely independent of CO2? concentrations. If this is covered in any of the papers referenced, my excuses. I’ll download them tomorrow. Re #56: Bryan, I would say it was more impatience than anger. Ray’s point, which you continue to refuse to recognize, is that the argument that anthropogenic CO2 is the predominant influence on the present warming is based on physics and quantified observations. Your assertions, on the other hand, are pure handwaving. Do you imagine that numerous climate scientists haven’t examined each of the factors to which you refer? If you disagree with their conclusions (which are based on the numerous references given on this site), it’s time for you to start putting up some *numbers* to support your case. Absent that, I suggest that it would be more constructive for you to ask questions than to continue making baseless assertions. Note that you’re trying to carry on this argument with someone who (among other things) writes textbooks on climate physics. “In my view, as geologists, if we want to seriously enter this debate, we must do so not only on the grounds of historical geology, but also on the ground that the debate it is currently being waged, atmospheric physics (Wien’s Displacement Law, Stefan Boltzman Law, the First Law of Thermodynamics, fluid dynamics, ocean heat storage and transfer, etc. etc.). How can we as a society ethically offer up opinions on the validity of anthropogenic climate forcings (and that is mostly about the physics), without having at least some level of basic knowledge? We need to quit pretending that this thing is nothing more than a great political conspiracy, and if we can, challenge it on the basis of solid science (observational and theoretical), not just arm waving. As petroleum geologists, we superbly understand the history of climate change as recorded in the rock record. Painfully however, we really do not understand much about the physics (incredibly complex and numerous coupled interactions of multiple laws) governing these changes. Since we adhear to uniformitarianism (present is key to past), maybe we should break down and begin learning something new about the present. Reasonable advice both from and to a petroleum geologist, IMHO. You could start with re-reading the extensive replies to your comment #5 above. Finally, regarding your accusation that Ray must be “agnostic” about the physics since he ascribes a degree of uncertainty to predictions of additional warming due to CO2, it seems very strange that someone with even a modicum of scientific training would be confused on this point. Again, I disagree with such a pessimistic and one-sided view. As far as I know, biological modelisation of planktonic response to acidification (low. 0,1 to 0,4 pH from now to 2100) is still in its infancy. Forams and coccoliths have a rather high rate of reproduction – a not-so-bad adaptative profile – and these species have survived to many abrupt climate changes of the past million years. Preliminary lab. experiences cannot be accepted as realistic simulations : Riebesell et 2000, for example, upwarded ambient atmosphere of a coccoliths monuculture to 800 ppm CO2 in 9 days !! That’s not conclusive for real-word adaptive behavior of theses micro-organisms over the forthcoming nine decades. I don’t say : there is no problem. But rather : let’s be cautious and avoid the catastrophic claims, or the credibility of science will be seriously weakened. Steve, I largely agree with Ray (defer to his expertise) on that point. What has given you the idea that I have not recognized his point? I quarrel with RC over giving the public the perception that the community has all of the important climate issues resolved. Yes, there have been many advances in recent years, but the poor model performance in replicating some important climate metrics point to possible potholes which are not being clearly communicated to the public and policy makers. Maybe these are why Ray is not *completely* sure. My argument is that the climate science community should not cease (by force of tyranny of the majority) to think critically about many of these forcings and feedbacks which still are poorly understood. Maybe they are, but I am not seeing the papers. Check the more recent work citing that article with Google Scholar, including newer work by Riebesell. And much else on acidification is news. The ratio of species changes dramatically, that’s the issue. This isn’t about extinction of specific primary producer species, it’s about which ones predominate and which ones become more susceptible to viruses and bacteria as calcite becomes soluble in surface sea water in about 2100. The human race has always been inclined to blame itself for whatever troubles that arise, and offerings to the gods have always been a part of the solution, may they be in form of slaughtered lambs or giant wind-powered generators. This is the main source of my personal scepticism of any theories of impending climatic doom. And, if you live in Scandinavia, as I do, retreating glaciers are indeed an ominous sign – but advancing ones are even worse. Raypierre – balderdash? – your comment about my post #49. First, I didn’t say anything about CO2 in my post and I don’t doubt it is a major factor in global warming. Second, you then go on to cite the Last Glacial Maximum as evidence of something, more or less helping me make my point that you can’t just cite the past to predict the future. Third, as for the basic physics, can it tell me when I can start building my beach house on some farm land I’m thinking of buying in South Georgia? Regarding Post #50, the link goes to a graph covering millions of years. I guess we could find another graph covering billions of years that wouldn’t even show Earth on it. That would be a real big change, right? What if the natural “balanced” climate cycle would bring an iceage? But due to AGW its not happening – and its just slowering the effect of AGW? And more importend on the bottomline what helps such hypotetical statement in such a debate? We should try avoiding any unnatural interference with systems which a) can lead to extinct of the human species – b) Can not be calculated with currrent data/know-how and computer capacity – c) Can bring our planet into a state which is considerate unbalanced in relation to present and past states(climate). We have the know how today to sustain this “paradies like” planet – under the circumstances and what is on stacks we should act yesterday rather than later. A “cooler than expected climate”!? I’d call that a fundamental disagreement (noting that you were referring to future climate rather than to the Phanerozoic, although it appears you were trying to refer to some sort of evidence from the Phanerozoic). There is a big distinction between saying the science is incomplete and that there is a degree of uncertainty about the timing and extent of future warming and saying, as you do, that the uncertainty is large enough to allow for the present warming trend to reverse into cooling. It isn’t. Abstract Rising atmospheric CO2 and deliberate CO2 sequestration in the ocean change seawater carbonate chemistry in a similar way, lowering seawater pH, carbonate ion concentration and carbonate saturation state and increasing dissolved CO2 concentration. These changes affect marine plankton in various ways. On the organismal level, a moderate increase in CO2 facilitates photosynthetic carbon fixation of some phytoplankton groups. It also enhances the release of dissolved carbohydrates, most notably during the decline of nutrient-limited phytoplankton blooms. A decrease in the carbonate saturation state represses biogenic calcification of the predominant marine calcifying organisms, foraminifera and coccolithophorids. On the ecosystem level these responses influence phytoplankton species composition and succession, favouring algal species which predominantly rely on CO2 utilization. Increased phytoplankton exudation promotes particle aggregation and marine snow formation, enhancing the vertical flux of biogenic material. A decrease in calcification may affect the competitive advantage of calcifying organisms, with possible impacts on their distribution and abundance. On the biogeochemical level, biological responses to CO2 enrichment and the related changes in carbonate chemistry can strongly alter the cycling of carbon and other bio-active elements in the ocean. Both decreasing calcification and enhanced carbon overproduction due to release of extracellular carbohydrates have the potential to increase the CO2 storage capacity of the ocean. Although the significance of such biological responses to CO2 enrichment becomes increasingly evident, our ability to make reliable predictions of their future developments and to quantify their potential ecological and biogeochemical impacts is still in its infancy. The conclusion is important, and it was the sense of my reply to Raypierre’s excessive alarmism. An other recent work show that pluridecadal variability of 0,1 to 0,3 pH is common in Pacific coral reefs (Pelejero 2005). So life is life, its evolution and adaptation to local conditions is a very complex matter – for this issue, what do we know exactly about functional genomics of calcification in plankton and coral species? I agree with you that modifications in relative populations dynamics (rather than global extinction) is a most probable consequence of rapid environmental changes predicted for the 21st century. Re #64: Climate science has already met the necessary standard. Continuing to ask for more evidence after that point has been reached is, well, balderdash. This is not iffy stuff, it’s basic acid-base chemistry, according to the scientists reporting it. There’s a whole lot of recent info available, this just one example. published in Nature on September 29, 2005 reports that ocean acidification could result in corrosive chemical conditions that would be reached much sooner than previously thought. Within 50 to 100 years, there could be severe consequences for marine calcifying organisms, which build their external skeletal material out of calcium carbonate, the basic building block of limestone. Most threatened are cold-water calcifying organisms, including sea urchins, cold-water corals, coralline algae, and plankton known as pteropods–winged snails that swim through surface waters. Projections for the “chemical state” of the surface ocean for years 2000 (top) and 2099 (bottom) given as the median of 10 ocean models. The magenta colored line (seen only in 2099) separates saturated waters (orange colors) from undersaturated waters (blue colors). It is difficult to understand how sea level rising at mm or even cm rates per year will drown many people. Drought (presumably resulting in no food) – I believe most peer reviewed studies actually predict total greater food growing capacity in a warmer world. Heatwaves, no clean water, plaques, war – Those problems are most likely to be solved by a prosperous economy with access to energy, and would likely be made worse by devoting excessive resources to reducing GHG emissions. Catastrophic weather events on a daily/weekly base – Is there any credible study indicating a sufficient increase in catastrophic weather events to threaten the lives of a significant portion of the world’s population? Notwithstanding the respectable qualifications of the contributors to RealClimate, I think the credibility of the site is at serious odds with its objectives: I quote, â? ?RealClimate is a commentary site on climate science by working climate scientists for the interested public and journalists. We aim to provide a quick response to developing stories and provide the context sometimes missing in mainstream commentary..â??. However, everywhere on this site I do not observe a balanced view. The aim of this web site looks more like â? ?â?¦We aim to provide a quick response to stories challenging the greenhouse global warming theory because we believe it is a scientific fact and we will counter with anything we can find that supports our view and our confidence that our climate models are infallible.â?? Why donâ? ?t you present an objective view of this important issue? As you dismiss yet another article, again resorting to unnecessarily insulting and arrogant language, perhaps you can explain why the climate of earth 125,000 years ago was warm enough to enable the growth of coral in a temperate latitude off the coast of south west Australia? The evidence for this is a fossilised coral reef sitting 3 to 4 metres above the present sea level. It is estimated to be 125,000 years old. The location (around 33 degrees latitude) is well south of present coral waters. If this is ‘basic acid-base chemistry’, why not honestly say the ocean may become less basic. Is anyone predicting a pH < 7.0? What pH is predicted? You could click on some of the links and find the answer to your question, along with far more information that I want to retype for you. And you’d have found it yourself, always best. Re #72: Robert, the period you refer to is the Eemian, which was known to be about 2C warmer (in places) and to have sea level about 6m higher than present. Since the current southern extent of tropical coral is no more than 400km north of the latitude you mention, the presence of that reef doen’t seem remarkable. As to why the Eemian was warmer than the present, at least in some regions, see here. Regarding the site, please bear in mind that anthropogenic global warming is a scientific fact and that there is no obligation to make room for contrary views if those views are incorrect. It is difficult to understand how sea level rising at mm or even cm rates per year will drowning many people. U missed something – who talks about drowning? This happens from many factors forced by rising sea levels. Such as water becomes salted from sea water – the complete economic gets unbalanced and species extinct( Yes new comes to – but into an unbalanced cycle). People are forced to move – leaving all they got – if this happens to millions – maybe u can try to imagine. And what means “most peer reviews studies”? Do you can provide a link – i doubt it. Drought brought us many results eg. less food yes – also forces people to move – also killing economics – destroying jobs – Just checkout http://de.wikipedia.org/wiki/Aralsee the image is kinda self explaining. Also plaques come up from this – also geological events (Sahara winds). You total messing here around with diffrent events. You also give ur personal individual few of things which is total wrong. Your conclusion shows how much u not into renewable energy efforts – see next point. I think this site gets spamed by paid trolls latly. To clear ur messy statement do the following. Point ur browser to google – than click on news – than enter “heatwave”. This brings up news from this year heatwaves which u obvisiously missed out – maybe u are 1 of the few who have no access to american television? And the image i provided is a bad example its caused by humans – yes because they changed the water fluctuation in these areas. On the effects on calcification: It is expected that calcifying organisms will find it more difficult to produce and maintain their shells and hard structures. However, the lack of a clear understanding of the mechanisms of calcification and its metabolic or structural function means that it is difficult, at present, to reliably predict the full consequences of CO2-induced ocean acidification on the physiological and ecological fitness of calcifying organisms. If we go back to the subject of Raypierre paper here, the problem deals with popularization of climate topics. The more alarmist you are on objectively indecise matters, the less credible you are (for these matters and also for others), because your readers suspect you are animated by a strong prejudice. As we say in French : tout ce qui est excessif est insignifiant. Hi, just curious again… have this paper bean discussed? The paper you cite (Pelejero 2005) does not go as far as you think it does. It discusses the response of one species of coral in one reef. It does not discount the seriousness of the acidification problem. Re #79: Bear in mind that Pat Michaels, the author of this paper, is rather notorious for being in the pay of the U.S. coal industry. It’s rapidly becoming a better idea to simply ignore such things rather than grant them the credibility associated with a refutation. So what’s wrong with this statement? See this previous RC post for the details, but the upshot is that at the time Michaels wrote that passage he was well aware that leading modelers (most prominently Jim Hansen and Richard Alley) have determined that the simple melting slab view of melting that’s included in the models Michaels referenced does not reflect reality, and that the dynamic melting that has been observed in the real world will cause a far more rapid collapse of the ice. Joseph, I agree with you, and never said acidification is not a (potentially) serious problem. Pelejero et al. did find decadal 0,1 to 0,3 pH variations in Flinders reef over the past three centuries, without noticeable modifications of growth for the concerned porites. That was just an example of a local adaptation to local variations (and a reminder of the amplitude of such variations for a south Pacific coral reef). But sure, a lowering of 0,2 to 0,4 oceanic pH over the next century will exert a strong selective pressure on calicfication species. Thanks for the point Steve, the document have started to “flow” around in Sweden. On the other hand, coral reefs are dying from acidification all over the world, and they were centers of ocean biological activity. The ocean is in danger from acidification even if natural selection will help some survivors adapt to it. Don’t forget how natural selection works — time and death. Along those lines, what if we had been threatened by a Martian invasion? There is a difference between magical thinking and drawing conclusions from empirical evidence and experiment. You are wrong to ascribe scientists’ conclusions on global warming to the former. Where did you get that idea? As far as I know it’s completely wrong. If you take the most basic model of all — the area available on a sphere like the Earth — global warming moves agricultural belts toward the poles, which makes them smaller. I disagree. Again, we should be precise in our assertion. Have a look on Royal Societey 2005 report : Acidification is NOT a past and present stress for coral reefs “all over the word” – even for cold-water corals which will be the more concerned by the phenomenon on short term (Lophelia sp. notably). Main actual threats on coral reefs are warming-induced bleaching (catastrophic El Nino 98), human pollutions in lagoons and coastal areas, parasitic invaders (algae, etc.). But acidification per se is not still a problem for reefs and the recent trend is rather clearly positive for some large-studied genus like Porites (for example Buddemeier 2004 : “Calcification rates of large heads of the massive coral Porites increased rather than decreased over the latter half of the 20th century”. On Porites : Bessat 2001, Lough 2000, etc. ).It’s difficult to draw global conclusions because of the numerous factors involved in each local conditions. All the more so that even the most extensive surveys do not cover all the coral area and biodiversity. But for that I know, coral reefs do not presently die of the 0,1 pH acidification since pre-industrial times. It does not mean that a 0,4 pH centennal drop is not a serious concern for all calcifying organisms: it is ! In my sense, avoiding premature and catastrophic claims, amplifying research efforts is a the better way to deal with it – except if you have a political agenda and want to impress imaginations for rapid collective decisions. But it’s no more science. Re #87: I think Charles is correct that the damage to coral reefs that has been seen in the last decade or so is from warming (possibly with an additional effect from acidification, but likely that would be hard to tease out of the data at this relatively early stage) , noting that the tropical seas have warmed more than the global average. It seems entirely plausible that some coral species will do a little better in water that is a bit warmer or a bit more acid, but even more plausible that it will be a different story if they are put into a temperature and acidity range that is well outside of the one in which they evolved. In the just past issue of the New Yorker (probably still available today), Elizabeth Kolbert has a long article on ocean acidification. I wasn’t able to read the whole thing, but it appears to have a lot of up-to-date material from interviews of many of the leading researchers. Re #87: Charles, I recall several years ago a popular hypothesis which linked some of the decline of Carribean corals to dust being transported from Africa due to drought and landuse changes there. Can you update me on whether the dust hypothesis ever caught hold? Perhaps I missed something, but Bill Broad may have been blind-sided by gun-for-hire “scientists” (paid by the black-gold naysayers) who deride anthropogenic climate change because it interferes with business. Thus, his take may have been flavored with doubt, although that does not justify the tone of the story. Tuesdays forray into even more questionable impact “science” without sufficient skepticism or caveats (this was based on an abstract to AGU) does not bode well for readers of Science Times or policy makers who read it. Agreed, George. That’s why I was hoping he’d come here or otherwise tell us what his sources and references were for what he wrote. The man’s been fooled before, for example he coauthored the primary “nerve gas factory” story used to rush an attack into Iraq. Oops. The farmer plants by the kind of weather he had the year before. Energy in the atmosphere increases variability. So, whether a farmer’s area is colder or warmer, wetter or drier, the extra energy in the atmosphere is going to increase the variability in weather that the farmer can expect. The following paper “Empirical evidence for a nonlinear effect of galactic cosmic rays on clouds” by, R. Harrison and D. Stephenson, provides evidence that global cloudiness is in fact decreased during sunspot maximum and Forbrush events. 1) Harrison and Stephensonâ? ?s paper discusses GCR modulation effects which are minor as the earth’s magnetic field is currently at a 100kyr maximum. In the next comment, a paper is quoted that provides evidence that the earth’s magnetic field suddenly increases on a 100kyr cycle and that this change and other observed changes in the geomagnetic field (not insolation cycles), is a trigger for glacial terminations and other major changes in the geoclimatic record. The next paper provides an explanation for the 100 kyr eccentricity paradox. 2)Note GCR modulation effects are less when the earth’s magnetic field is high and/or when the sun is at a maximum in its magnetic cycle. The comment ” the tired old beast of Galactic Cosmic Rays (GCR) raises its hoary head…” [and] “There has been no recent trend in cosmic rays that could conceivably account for the recent warming…” discounts or perhaps completely ignores recent data and analysis that provides support for the hypothesis that GCR modulation is a first order climate forcing function. What is the evidence that GCR modulation effects on cloud cover have had a major affect on the earth’s climate in the past? How will GCR modulation affect climate in the future? The paper “The Glacial Cycles and Cosmic Rays” by J.Kirkby, A. Mangini, and R. Muller (2004) examines changes in the geomagnetic field, that are concurrent with major planetary temperature changes. Due to GCR modulation effects on clouds, it is hypothesized that a stronger geomagnetic field results in warmer temperatures and a weaker field, colder temperatures. The authors examine deep sea sediments and find as have others that the geomagnetic field peaks at 100 kyr intervals. Further the authors find at termination II (Warming that led to the Eimen interglacial) that the records show that the warming started when insolation was at a minimum. They also find that the termination II warming and other warming events coincide with periodic geomagnetic field maximums. Well statistically CO2 is linked to planetary temperature more as an effect not substantially as a cause. So this is a very strange thing to say. Hi, raypierre. Instead of commenting on a single throw-away statement, I would rather get an opinion on the two papers referenced by William Astley. Reading them, I get the impression of a far greater correlation of cosmic radiation and climate than I had been led to believe. The suggestion that glacial cycles are driven by the inclination of the Earth’s orbit around the sun rather than eccentricity is interesting. Is it a coincidence they both have the same period? And all three glacial cycles show up in the ice age record, and eccentricity amplifies some of these cycles, so I have a hard time dispensing with eccentricity. However, I do not see how much relevance this has to the present climate. The shortest cycle they identify is 100 Ky. And I would like to know just how large this “small but statistically significant” effect is in meaningful units such as watts per square meter. Let me second the call for Raypierre to do something more than pounce on the #96 post that carelessly used the word planetary when probably Earth was intended. I’ve never seen a convincing explanation of how temperatures can begin decreasing when CO2 levels are high as they are at the end of each interglacial. Or, is it that for some reason CO2 levels begin decreasing on their own and that is what brings down temperatures â�� some unknown, mysterious regulator of CO2? About the inclination theory, the inclination of the Earth’s orbit around the Sun has changed over a 100k year cycle for the last million years or so. When there is less inclination, the Earth is cooler. When there is more inclination, the Earth is warmer. Is this just an odd coincidence or is there some link between Earth’s temperature and the inclination. Muller originally proposed that there might be space dust in the orbital plane that came into the atmosphere to cool the planet during times of low inclination. That theory so far hasn’t panned out. So this GCR connection is a second attempt to find a link. The relevance to the present is that our orbital inclination has been declining since around the start of the Holocene. Re #97, Blair Dowden, and #99, Jim Cross — I believe these topics have been rather thoroughly gone over on at least two previous threads. I recommend finding and reading those.